The 2009 Sarasaviya Awards hailed a celebration of unquenchable talent and exceptional brilliance Among the many stars that dazzled the night, one star's shone out with unparalleled lustre. 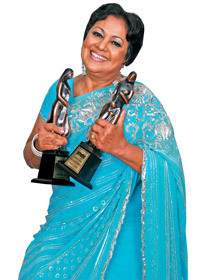 'The Queen of Sri Lankan Cinema',Malini Fonseka notched the 'Vishwa Prasadini' Award for her eternal flame of talent that has dazzled the Sri Lankan cinemascope, bagging international recognition for this small land. Speaking to Daily News, an enthusiastic Malini said that she was extremely proud to be honoured with such an exclusive award, this being the first time in history that the 'Vishwa Prasadini' title was awarded. Her praise and gratitude for Director, Akasa Kusum, Prasanna Vithanage was lavish as she noted that he had opened the Sri Lankan cinema to a totally unique avenue. "Prasanna Vithanage was the leading force behind my award. Through his film, Akasa Kusum, he gave me a both a wonderful opportunity and challenge in harnessing my talents. 'The Queen of the Sri Lankan Cinema' was born on March 30th, 1947. The third of a massive family of eleven, her talent was evident from an early age. Her career as an actress kicked off in 1963, at the tender age of sixteen with the play, 'Norata Ratha'. By 1965 she had set her mark, winning the Best Actress Award for the play, 'Akal Wessa'. Malini's life on the reel spun into action in 1967 in Tissa Liyanasuriya's Punchi Baba. It was the start of the miracle. Her magic was unexplainable, reaching dazzling heights through the ages with a career spanning over four decades. In Nidhanaya(1972) she brought tears to the eyes of the viewer as the unsuspecting young wife of a impoverished nobleman who uses her as a 'sacrifice' to discover a treasure. She created history in her role of Susila in 'Eya Den Loku Lamayek'(1975). It won her the award for the Best Actress in the Moscow International Film Festival, the first Sri Lankan actress to win such an award.As Helen in Bambaru Awith, Malini broke the norm by starring in a controversial role that brought her much acclaim. Her other notable roles include those in the films Abuddasse Kale(1968), Veera Puran Appu(!979) Baddegama(1980), Soldadu Unnehe(1981) and Umayangana(1992). Her onscreen chemistry with Gamini Fonseka and Vijaya Kumaratunga would be know as the Malini-Gamini and Malini-Vijaya decades in the years to come. Mailini's magic never fades. The twenty first century, which would have heralded decay for any other actress of the bygone days, simply boosted her glory. Wekanda Walawwa(2003) and Aba(2008) were cush notable examples. However Akasa Kusum(2009) was her crowning glory. Both timely and thought provoking, the film showcased her outside the usual black-and0white mold, proving her versatility as an artist An unforgettable milestone in the Sri Lankan cinema, the film bagged her the Silver Peacock Award in the 39th International Film Festival held in India last year.